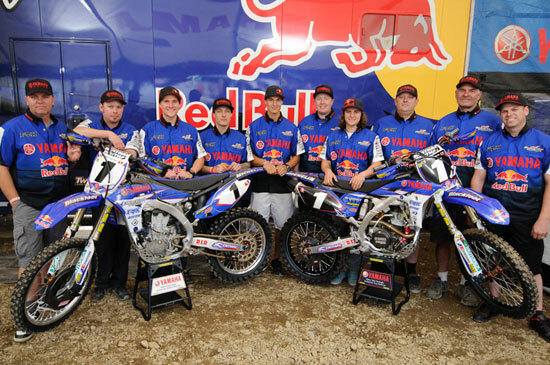 For the second consecutive weekend, Team Yamaha Red Bull Blackfoot Fox Racing’s Colton Facciotti and Tyler Medaglia set the pace in the Canadian Motocross Nationals. 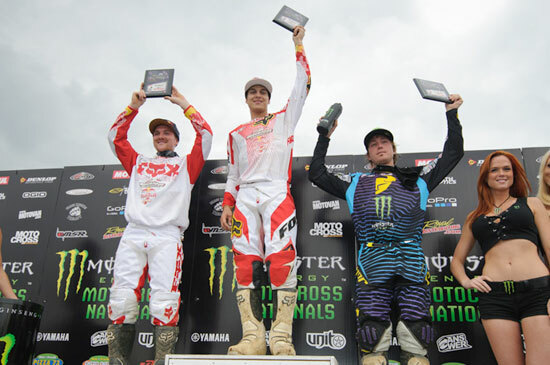 It was Round 2 of the title hunt, in Nanaimo, British Columbia on Sunday. With another impressive clean sweep of the motos, Facciotti took no prisoners in the premiere MX1 class while Medaglia claimed the MX2 overall on the strength of 2-1 motos. 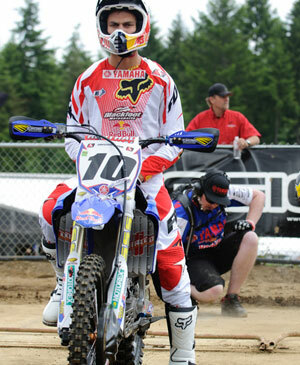 Identical to Kamloops one week earlier, Dusty Klatt brought up the rear by securing a noteworthy second overall. 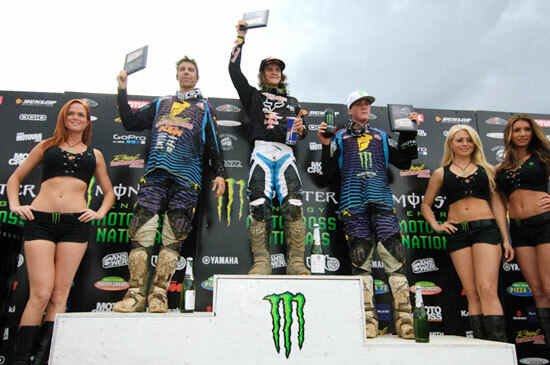 The defending champion recorded consistent 2-2 motos to clinch the deal. A sizeable crowd flocked to the fabled Wastelands motocross track, which returned to the CMRC Nationals schedule this season after a two-year absence. Not surprisingly, many of them turned out to cheer on home track rider Klatt, who lives down the coast from Nanaimo in Campbell River. In the first MX1 moto, Klatt put his potent YZ 450F into the lead just seconds after rounding turn one alongside Brock Hoyer, who had grabbed the holeshot. Buoyed by friends, family and local race fans, an “on fire” Klatt put some ten-bike lengths between himself and the chase group, which included the American trio of Bobby Kiniri, Bobby Marshall, Teddy Maier, and Klatt’s Blackfoot teammate Facciotti. While Kiniry and Maier engaged themselves in a battle over second place, a focused Facciotti bided his time to stick a pass on them. 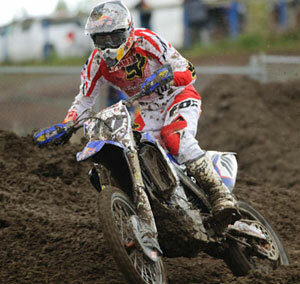 Some two laps into the moto the Aldergrove, BC native made his move. Once Maier had been taken out of the equation, it didn’t take Facciotti long to hunt down Klatt, who was laying down a blistering pace up front. After swapping the lead back and forth a few times Facciotti finally managed to take firm control of the moto. Although he didn’t exactly leave Klatt in his wake, little by little Facciotti built up a five seconds advantage over his teammate by the time the race had run it’s course. Klatt, for his part, had put about 30 seconds on Maier, who was third across the finish line. Although neither Klatt nor Facciotti got a top-five start in the second moto, within a few laps they were mixing it up with the frontrunners, which included Maier and Kiniry. After Kiniry went down, Maier took over the lead with Klatt following a few seconds behind. Facciotti, who stalled on the same lap as Kiniry went down, dropping from third to sixth, got back on the gas to reconnect with Klatt a few laps later. Together they hounded Maier who did everything he could to keep some distance between himself and the Blackfoot duo. Just before the halfway mark, however, Maier had to give into Klatt’s relentless attacks only to have to deal with an equally relentless Facciotti. The writing was on the wall: within a lap Facciotti stuck a pass on the former MX2 Champion. The race was now on between the teammates for what would end up being the overall, which unless a worst-case scenario presented itself, was going to belong to either Klatt or Facciotti. Some five laps later Klatt, who pulled out all the stops, caved to an overbearing Facciotti. Once in command of the lead, Facciotti took it home all the way to the checkered flag. At the finish line he had a 12 seconds lead over Klatt, who in turn gapped third place Maier by 30 plus seconds. “I’m thrilled to make it two in a row and excited for the team that we got 1-2 on the day again. My hat goes off to Dusty who made it a tough win. 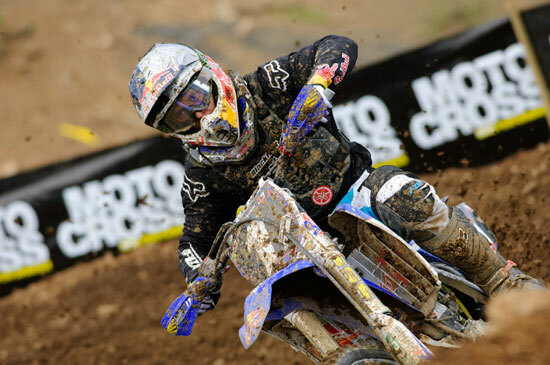 There’s no doubt that our YZ 450F’s were the best bikes on the track, making our jobs just a bit easier,” said Facciotti. “I was looking forward to winning today on my home track but it just wasn’t meant to be. I gave it all I had but Colt just seemed to have a little more. Still, taking second overall with 2-2 motos is satisfying enough and it keeps me in contention for the title, which is all that really matters,” said Klatt. In the volatile MX2 class, defending champion Tyler Medaglia delivered a first moto start that saw him somewhere around 10th place going into turn one. With most of the top riders in the class between him and first place, Medaglia would have no easy road to the front. Undaunted, Medaglia pushed his YZ 250F to the limit to take a well deserved third place at the finish line behind Kaven Benoit and Tyler Sjoberg. But thanks to a Red Cross medic alert infraction, a hapless Sjoberg found himself being docked 10 places, which shuffled Medaglia into second place. Booking his first really good start of the season, Medaglia snared the second moto holeshot with Austin Politelli, Sjoberg, J. Medaglia and Benoit in tow. Politelli, riding his first season of the Canadian Nationals, took the lead not long after the frontrunners went through turn one. But his role as leader of the pack would last less than four laps. Determined to claim the overall, Medaglia stuck to Politelli like glue as they flew over the hardpack Wastelands track. Once he reclaimed the lead, Medaglia never looked back. He took the win by 26 seconds over runner-up Sjoberg, who had managed to stick a pass on his teammate Politelli. “Taking my second overall win in a row is really sweet but I was more excited today about getting a good start in the second moto than anything else. It makes life a lot easier when you don’t have to come from behind, especially last place like last Sunday,” said Medaglia. Round 3 of the points chase resumes on Sunday, June 19, in Calgary at Wild Rose MX Park, home track of Blackfoot Racing. Check out the updated 2011 website: www.blackfootracing.com and link to all the team's premiere sponsors who have partnered with Blackfoot Racing’s Championship effort.